My partner, Mr. 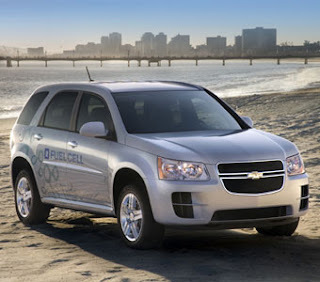 Outgoing, has been in LA on a press junket with gay journalists to test drive GM cars, including the new hydrogen-powered Equinox. Because you know how into cars we gay people are. Anyway, I got caught in rush-hour gridlock when I went to pick him up at the airport, which forced me to create a new route using surface streets. I know it doesn't sound like much, but it made me feel very intrepid. If I could drive, I'd learn all the side streets and take those. It seems like a lovely idea. I guess I'll have to wait another year though for my license. . . Surface streets. As opposed to below-the-surface streets? It's always wonderful and intrepid to take streets that are out of your comfort zone. Lillian and I do it frequently (with her driving of course, because she has a GPS unit in her head), and we see new and wonderful things. We call them "mini-adventures". Good for you!